For all the counsel rolling Rory McIlroy's way on the eve of his 10th Masters, none will legislate for the war Augusta National wages on a human pituitary gland. Maybe the old American pro, Frank Beard, put it best. Two years after finishing a career-best tied-fifth in '68, he observed that most players feel they could "lick" Augusta with their normal game, "if they ever calm down enough to play their normal game". This is Ulsterman McIlroy's fourth year pitching up in north Georgia with the pursuit of a career Grand Slam the rippling sub-plot to his bid for a green jacket. And the stark truth is he has never genuinely contended on Masters Sunday since that wretched back-nine meltdown in 2011. The cognoscenti insist that his game is perfect for Augusta with that inordinate length off the tee, high ball flight and natural right to left draw. But the press of history, the desire to put himself in a select group of just Ben Hogan, Gene Sarazen, Jack Nicklaus, Gary Player and Tiger Woods, inevitably complicates the psychological challenge now facing McIlroy. He admitted as much two years ago after a tied-10th finish, reflecting: "I'm trying to deal with the pressure of it and the thrill of the achievement if it were to happen. I think that's the thing that's really holding me back." Paul McGinley's suggestion that he, maybe, needs to rein in his natural aggression and play more strategic golf makes sense, ostensibly at least. But it is unlikely to find favour with McIlroy. In 2016, he blamed a third-round 77 on playing "too tentatively" or, as he put it, "trying not to make mistakes instead of attacking and trying to make birdies. "Trying not to make mistakes is not my game, that's not what I do." Therein resides the crux for McIlroy this week. He knows he can, as Beard put it, "lick" the course as evidenced by his first three rounds in 2011 or his last 45 holes in 2015, covered in 15 under. But he knows too just how penally the course will punish carelessness. In six of his nine Masters tournaments to date, McIlroy has shot a 77 or worse to sabotage his title bid. He was one shot off the lead halfway into the 2012 tournament, but fell apart on the Saturday front nine, covered in six over. One year later, he endured another Saturday blow-up, a triple bogey at 11 and double-bogey at 15 (he was in the water at both) contributing to an ugly 79. In 2014, he barely made the cut after a second-round 77 and failed to make a single birdie in that 2016 third round when partnered with Jordan Spieth. And now? His bogey-free closing 64 to win the recent Arnold Palmer Invitational (McIlroy's first tournament victory in 18 months) has ensured that he goes out at Augusta as joint-favourite alongside Dustin Johnson and a resurgent Woods. McIlroy birdied five of the last six holes at Bay Hill with a spectacularly aggressive putting display, yet it remains a moot point if such aggression would be wise on greens that have borne witness to such mass emotional destruction over the years. The 1948 champion, Claude Harmon, once remarked: "Reading an Augusta green is like reading the small type in a contract. If you don't read it with pain-staking care, you are in trouble." Putting has never been the strongest part of McIlroy's game, albeit he will take heart from the knowledge that defending king Sergio Garcia was once dismissed as too inconsistent on the greens to be considered a likely champion. Of course, until and unless he wins a green jacket, that ugly closing 80 in 2011 will continue to define McIlroy's relationship with The Masters. And yet it ought really to ennoble him too, given the dignity communicated by the then 20-year-old with the eyes of the world watching. McIlroy, remember, had a four-shot lead going into the final round and was still one clear on 11 under at the turn. But then that ugly hook off the 10th tee hit a pine trunk so hard, his ball almost came to rest on the porch of the Berckmans Lodge. That led to a triple bogey, followed by bogey on 11 and double-bogey on the notorious par-three 12th. When he then hooked his drive on 13, McIlroy's tournament was over. And he still had an hour and a quarter of golf to play. It was popularly deemed the starkest last-day collapse at Augusta since Greg Norman blew a six-shot lead to come home trailing '96 champion, Nick Faldo, by five. He watched Charl Schwartzel birdie four of his last five holes to take the jacket, yet the galleries applauded McIlroy home too, recognising the very public agony being experienced by a young man. "I don't know if people were just feeling sorry for me or what," he said after. "But I appreciate it." The following day, he shared a flight to Malaysia with Schwartzel, tweeting a picture of the two with a caption: "Glad one of us has a green jacket on!" Now, seven years on, he returns to that perfectly manicured corner of north Georgia, his world a babel of advice on how to conquer Augusta National. On his bag will be Harry Diamond, one of three friends from home who travelled to that 2011 Masters in support of their old classmate. Back then, there was still the air of a great adventure about McIlroy's pursuit of golf's big prizes, the four friends watching Ulster's Heineken Cup defeat at Northampton together rather than fixate on the weekend opportunity. Time educates and changes in equal measure, of course, yet chances are that McIlroy will now return to that elegant, self-assured place knowing full well that the most important battle looming will be one of nerve, not strategy. By Adam McKendry With his parting words at Augusta on Sunday afternoon, Rory McIlroy stared wistfully at the leaderboard by the 18th fairway. 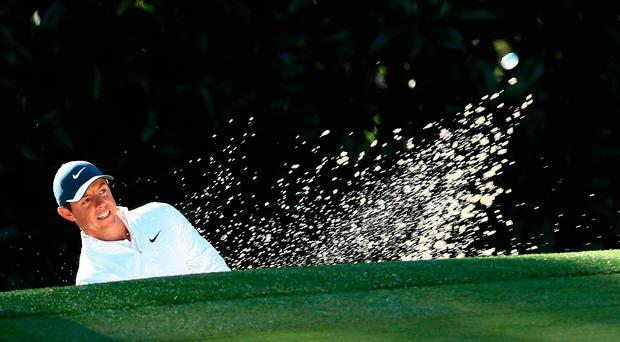 By Vincent Hogan The length of Tiger Woods' shadow obscured any other narrative rolling up out of Augusta on Sunday, so frustration at another lost major for Rory McIlroy never found compelling traction.